Macau is part of China now, it was the first and last European colony within China. Portuguese traders had settled and colonised Macau from the 16th century till its handover to China in 1999. Because of this, Portuguese had strongly influenced Macau's architectural buildings, culture and food. Macau has long famous for its tourism, gambling and food. I'd been to Macau few times while I was working in Hong Kong. It's easy to get there from Hong Kong, just hop on the ferry. I love this place a lot. Every time we went there we were food crawling all day and all night till we dropped. 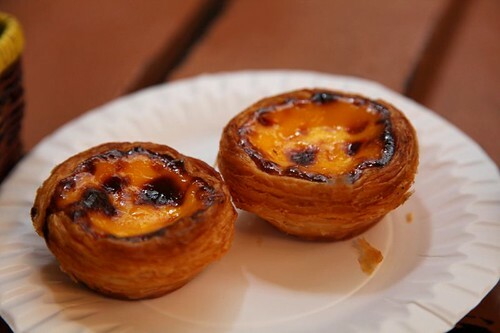 My favourite Macanese food are fried pork chop buns, crab congee (rice soup), Portuguese style egg custard tart called 'po tart', all the Macanese snacks, Macanese chilli crab, African Chicken and Portuguese Chicken. Macanese food many are Chinese - Portuguese fusion. I am very surprised not to find many Macanese recipes in books and on the internet. Portuguese chicken (Po Kok Gai 葡國雞) is Chinese - Portuguese fusion. I don't think anyone can find this recipe in Portugal. 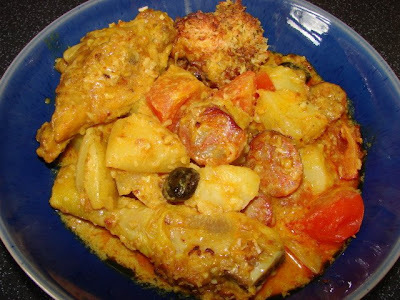 This dish is like a mild chicken curry with Portuguese/Spanish ingredients like chorizo and olive. Very unusual combination, it works and delicious. Here is the recipe, will feed 5 - 6 people. Can reduce quantity to make a smaller portion. If chicken pieces are large cut into half. Season chicken with salt and pepper and leave for 30 minutes - 1 hour. Then mix with plain flour, turmeric powder, paprika and some water to evenly coat chicken. Boil potatoes for few minutes till almost cooked through. Drain and set aside. Heat wok with oil. Fry chicken pieces in two batches till brown for few minutes. Do worry if not cooked through. Take them out to drain off excess oil on kitchen paper. Remove oil from wok and clean wok. Use 1 - 2 tbsp of the chicken frying oil and stir fry onion, garlic and chorizo till onion is softened. Then add chicken, bay leaves and potatoes. Then stir in milk, coconut milk, chilli powder and enough salt to taste. Stir and cook for a minute or two till the sauce is hot and thickened, if sauce looks too thick add some water or more milk. Then stir in tomotoes and olive. Put all this in a large baking dish. Sprinkle with dessicated coconut. Sprinkle a little water on the dessicated coconut to prevent coconut browning too quickly. Bake at around 170 - 175 deg C for about 30 - 40 minutes till the whole dish is hot and bubbly and coconut is browned. Serve this chicken with plain rice, egg fried rice or bread. Nobody can find this recipe in Portugal, because this dish was originated in Macau, it just simply does not exist in the Portuguese culinary world. Should you dine inside a Portuguese restaurant anywhere in Portugal and ask for Portuguese chicken, all the waiters and chef would do is scartching their heads! I did mention it's fusion and from Macau, not found in Portugal if you read the post. I am from Hong Kong and love this dish. The Portuguese sauce made by Lee Kam Kee is too salty. I will try your recipe one day. My friend Serena made this for me and it was fantastic. I cooked this for dinner last night and it was great. I will definitely make it again. Thanks! holy balls my buddy that grew up in macau and I made this last week and it was maybe the most amazing thing i've put in my mouth since that weekend i spent freelancing in the red light district. yowza!